Works as a vacuum, blow dryer and inflator! Introducing the VAC N BLO, PRO SERIES, the BEST wall mounted detailing vacuum cleaner/blower. BIG capacity, outstanding power. A complete cleaning station for your garage! The PR0-83BA provides exceptional power and versatility. Conveniently mounts to the wall or roll it over to your favorite car. Overwhelming air movement for suction, drying, and inflating. Metro Vac N Blo, is the first choice of professional detailers nationwide! 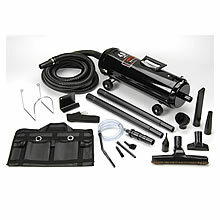 Full Size Vac N Blo Vacuum cleaner/blower with accessories. Features a body of all-steel which withstands years of heavy use and abuse and with a 4.0 Peak HP, twin-fan, industrial quality motor producing an almost unbelievable 95 inches of water lift (the standard measure of vacuum efficiency) and comes with a full range of specialized automotive attachments to reach every nook and cranny of your vehicle’s interior.